For the 25th anniversary of the Honolulu Festival, Orochiyama has molted out! Thanks to the cooperative ties between colleagues in Honolulu and craftsmen who serve God in Japan, we were able to reproduce the whole thing. Sharp eye and fang excavating plague. Large ears and large horns symbolizing almighty. A treasure sword at its tail is an embodiment of Kusanagi sword. 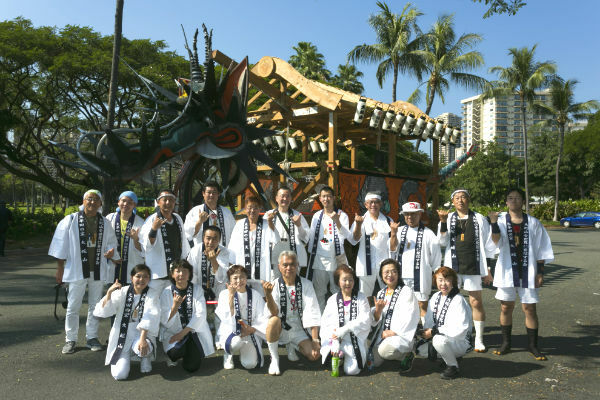 GIANT SNAKE MOUNTAIN who has divinely molted enters the Kalakaua avenue along with a goddess dancing party and fiery flame!! We are here to perform Hawaii’s traditional hula. We would like to promote cultural exchange through this popular medium. We are back again to dance gracefully. Please give us a warm welcome. Anyone can do it. Anyone can be strong and anyone can be healthy. Our school puts emphasis on Karate and its hand movements as a method of self-defense, not as a competition. We practice breathing and self-defense movements while aiming at improving our body and mind at the same time. Along with our training, we exchange friendship in order to attain a better life. 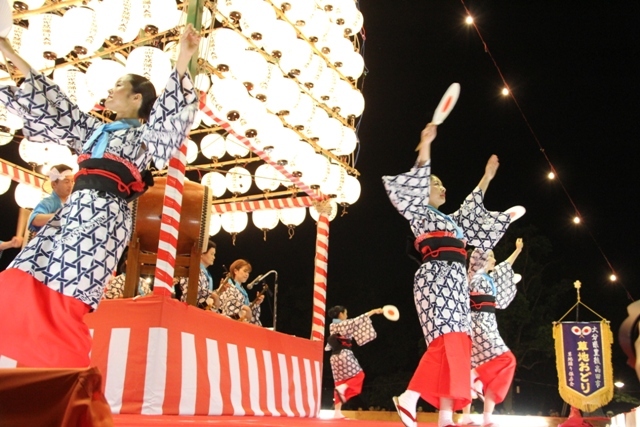 The Kusaji dance began in Bungotakada, Oita Prefecture around 300 years ago. It is composed by four types of dance. Also, the dancers quickly shift their costume accordingly to each dance which is one of its attractions.